Preview images and spoilers for the Once Upon a Time episode "Where Bluebirds Fly"
In flashback, Zelena befriends a young woodcutter who has been cursed and turns to her for help finding a new heart. Zelena is forced to choose between keeping her powers and her friendship with him. 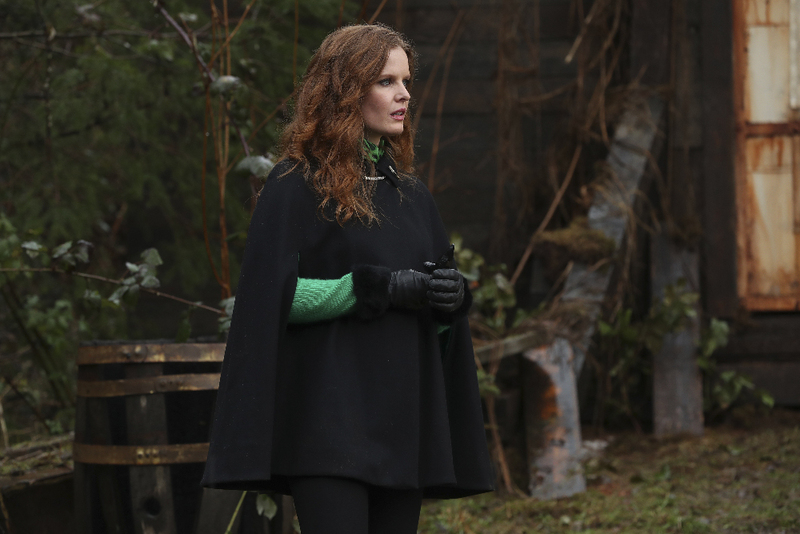 Meanwhile, in Storybrooke, Zelena decides to take on the Black Fairy and put a stop to her, once and for all, against Regina’s wishes, and the Charmings disagree over Emma and Hook’s wedding plans, on “Once Upon a Time,” SUNDAY, APRIL 23 (8:00–9:00 p.m. EDT), on The ABC Television Network. Guest starring in the April 23 episode are Keegan Connor Tracy as Mother Superior Blue Fairy, Beverly Elliott as Granny, Giles Matthey as Gideon, Jaime Murray as Black Fairy, Alex Desert as Stanum, Austin Obiajunwa as Young Stanum, Dylan Sloane as Bully, Jorden Birch as Oz Guard #1 and Isabella Black-Thomas as Young Zelena. “Where Bluebirds Fly” was written by David H. Goodman and Bridgette Hales and directed by Michael Shultz.